Posted December 2nd, 2014 by TheGolfersClub & filed under Competitions. Adidas Golf’s gripmore techology is an innovation in cleat design that combines the performance benefits of spiked and spikeless footwear. The evolution of golf cleats has seen little change in innovation over the course of the last century. 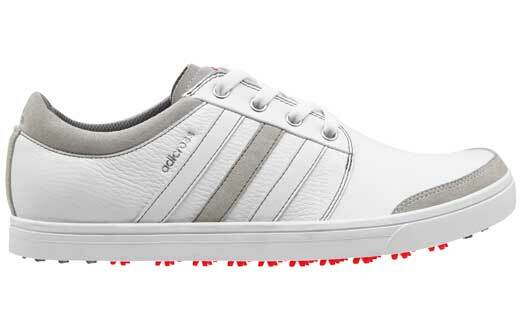 The Adidas Golf team set out to change the state of the footwear game, embarking on a mission to reshape the industry to create a groundbreaking category of shoe for all golfers. The result: Adicross gripmore and pure 360 gripmore sport. Unlike traditional spiked golf shoes that require receptacles to house cleats on the sole, gripmore cleats are directly injected onto lightweight mesh matting inclusive of hundreds of microspikes for even more traction and stability. In addition, both models are among the most green-friendly the company has ever created. The adicross gripmore utilises 43 gripmore cleats and a total of 243 points of contact for the ultimate combination of versatility and performance. 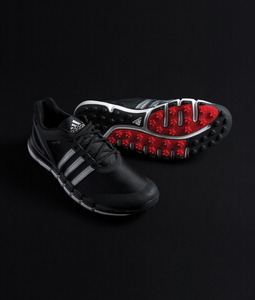 2013 U.S. Open Champion and adidas Golf Tour staff professional Justin Rose is a huge fan of the shoe’s crossover performance characteristics. “I’m always looking for footwear that provides traction without compromising comfort, style or on-course performance,” he said. With a more athletically-inspired design, the pure 360 gripmore sport features a waterproof mesh upper with climaproof, 360WRAP technology and a power band chassis for increased stability. Featuring 23 gripmore cleats and a total of 161 contact points, the shoe provides exceptional traction with the combination of comfort, protection and performance. In testing, we found the gripmore one of the most comfortable on test with excellent performance from the new cleat technology. They are smart and can be easily worn off the course. Very much of a trainer style so may not suit the traditionalist but will be perfect for others. The Golfers Club is offering a lucky member the chance to win a pair of Adicross gripmore shoes signed by Justin Rose. Q: How many points of contact does the adicross gripmore have? To enter, email your answer to competitions@twww.golfcare.co.uk with your name, membership number and contact number. The prize draw will take place on the 2ndJanuary 2015.